When Kavitha Sampath was employed as a Post Office Assistant, she enjoyed her job so much that she made it her long term aim to one day have her own business doing the same. 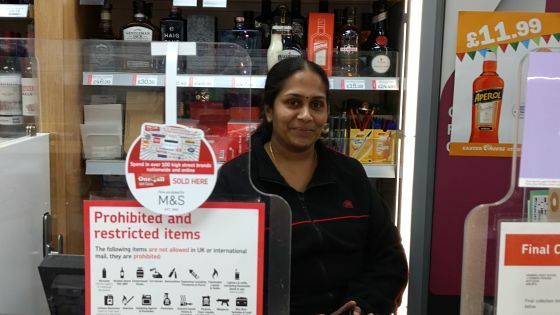 When the opportunity arose to purchase a Post Office in Rayleigh, Essex, Kavitha seized the opportunity to make the step from employee to business owner. We spoke to Kavitha about her start-up journey. Tell us more about your business and what inspired you? Hambro Post Office Food and Wine is on Hullbridge Road in Rayleigh. I am now approaching the first anniversary of founding my own business. The shop is a community Post Office. We also sell quality wine, beer and food. I have a lot of experience in the industry, and with 100% support from my family, I purchased the business, which already had good trading records, and was determined to build upon its success. How did Nwes support you with your new venture? Through the Start & Grow programme, Nwes provided me with business support and advice, which helped me to write my business plan. I built on my knowledge and skills by attending free workshops on Financial Forecasting and Employing People. Nwes also supported me to make an application for a Start Up Loan which, once successful, I used to support my own investment to purchase the business and refurbish the shop. Initially there was a lot of work to do, and many new skills to learn but the hard work and effort was worth it when the refurbishment was complete and I flipped the ‘closed’ sign to ‘open’ on my own business. I gained my first customer on the first day of opening my shop. I felt fantastic. Despite working long hours, I am relishing every minute of achieving my dream of running my own Post Office. The highlight has been pushing myself and developing my own self-esteem to achieve what I had always wanted to do. What has been the impact of Nwes’ support? The impact was huge. Help with my Start Up Loan application was invaluable, as was preparing a business plan and presenting financial information in the correct format. I made sure I received as much advice as possible. Operating my own business has been a long-term ambition for me. Working with my Nwes Business Advisor has helped me to realise my dream.